After an adventurous adolescence lived on the high seas, Joseph Conrad spent 30 years of his life as a successful writer. His novels and short stories explore the nature of narrative, reality, and competing notions of truth. This new volume offers a new selection of contemporary critical commentary on the author of such classic works as Heart of Darkness, Lord Jim, Nostromo, and the short story "The Secret Sharer." 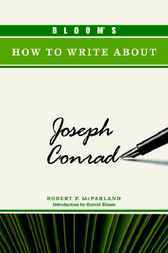 Bloom's How to Write about Joseph Conrad gives useful advice for writing essays on Conrad, including sample paper topics, and features an introduction by noted literary critic Harold Bloom.